Alec Montgomery and Ryan Cabildo with board member Susan Cargill. We are proud to announce the scholarship winners for the 2016/2017 school year, each of whom will receive $1,000 to apply toward their continued education. The scholarship for music is awarded to Ryan Cabildo. He is a saxophonist and has earned many honors in his field. He was selected several times for the Illinois Music Education All District Band and Jazz Ensemble. He was also selected to the All State Jazz Ensemble, and he has been an outstanding musician throughout his high school career. Along with music, Ryan is academically gifted and is near the top of his class. The scholarship winner for art is Zachery Michaliska. (not pictured) He plans to attend Ball University in Muncie, Indiana. His goal is to receive a Bachelor's Degree in architectural studies and then work toward a Master's in architecture. His high school activities included music and art, and he was a student athlete. Zachery attained academic honors. The scholarship winner for theatre is Alec Montgomery. He has worked on many productions throughout his high school theatre career. Along with theatre, Alec has been a part of the school's student council, marching band and Tri-M. He has been described as dedicated, creative and artistic. He is an academically, creatively and theatrically inclined student who plans to attend the University of Iowa. His goal is become a playwright. The Addison Center for the Arts awards lucky Addison Trail High School students scholarships to apply toward continued education in the arts. The application form includes general information such as submission details and eligibility requirements. The application is available for download here. The deadline to submit the 2018 application will be announced shortly. 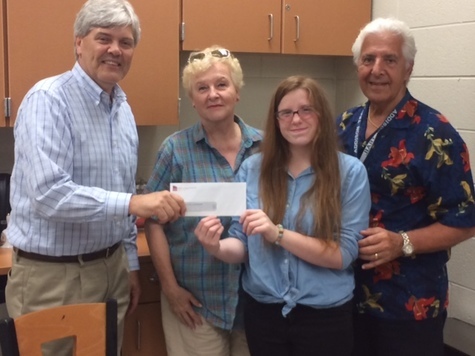 Board members Mark Turk, Harry Theodore and Susan Cargill present a scholarship check to 2015/2016 winner Angelene Ori.